If you’ve been reading my blog for any period of time, you know that I love to talk about how wonderful yoga is for runners. (In fact, it’s why I became a yoga teacher.) Today, I wanted to write about how runners can combine meditation and running to become mentally strong runners. The meditation techniques I’ve learned over the years have definitely made me a stronger runner mentally, and my hope is that you’ll try some basic meditation to see if it will work for you, too. First, what is meditation? There are many different types of meditation, and I’m sure if you asked ten different practitioners of meditation to define it, they’d all give you different answers. To me, meditation is about clearing the mind of thoughts and instead being present in the moment. It’s about letting go of desires, feelings, and struggle, and accepting what is. It’s incredibly hard to do at first, but with practice, it becomes quite natural. The way that I always instruct clients and students to start meditating is to find a comfortable seated position, bringing their attention to their breath. They start by taking long, deep breaths in and out, and once they’ve established their breath, they begin to focus solely on their breath, letting go of any thoughts that are running through their heads. At first, it’s hard to clear your mind for longer than a few seconds. Our minds are so used to having constant stimulation, so sitting quietly is pretty tough when you first try. But, I promise, if you practice meditating on a regular basis, it becomes easier. So you’re a runner, and you’ve gotten to be okay at seated meditation. 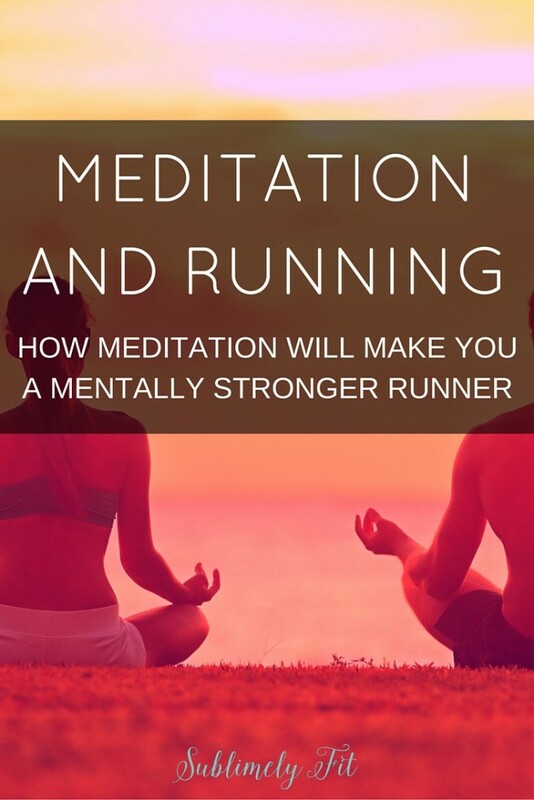 How do combine your meditation and running? I most frequently use the mental control I’ve used from meditation during difficult runs, usually speed work or at the end of a long run. Think of the points during a run when your mind wants to give up. Your thoughts start to race, start to tell you that you can’t keep this pace, that you’ve run far enough and don’t need to keep going, or maybe even that you couldn’t possibly keep going. At those points, I bring my attention to my breath, just like I would in a seated meditation. I focus on taking long, controlled breaths in an out, and use that focus to clear my mind of negative thoughts. I drop the emotional connection of frustration or disappointment in my performance, and I focus on the things that I can control as I’m running, my breath and my running form. By clearing my mind of any expectations I may have of how I should be performing on that run, or how I should be feeling, I’m able to be present, connecting with what’s sometimes called the True Self, who I am at the core of my being. For me, this is the real place where meditation and running meet. Even if you’re not ready to start meditating on a regular basis, I would encourage you to practice controlling your thoughts during your runs. Sometimes when you start out it’s hard to even notice that you have thoughts racing through your head, or that you’re doubting your abilities, but when you’re able to become more aware of your mental state, you’re better able to control it. By controlling self-doubt, you’ll be well on your way to becoming a mentally stronger runner. Want to learn more about how yoga can help you become a better runner? Sign up for my totally free Yoga for Runners 2 Week Challenge! Do you meditate? Have any interest in trying? How do you get through tough runs? « Static vs. Dynamic Stretching: What Should You Be Doing? Yes yes yes yes. I was amazed at how much my running benefited not only from the physical effects of practicing yoga, but also from the mental benefits–being able to calm your breathing, focus your mind, and, if your music turns off, quiet your mind. HUGE benefits. Seriously. I do all of my outdoor runs without headphones and it’s such an amazing experience. Not to mention that I’m able to run on pretty trails a lot so I get to see birds and butterflies and all that cool stuff. It’s all about being present! Really helpful, thanks! I’ve been trying to get into a meditation habit but keep losing track. This is a good reminder to start again. I definitely use meditation techniques and concentrating on breath when I run and it is helpful. It really is such a journey. I’ve gone in waves of practicing and not practicing meditation, too. Luckily it’s easier to get back into it when you know what you’re doing. 🙂 Thanks for commenting, Chaitali! I love this idea! I let my mind take over when I run, which is always a bad thing because I end up slowing down and giving up. I need to work on getting past those thoughts so I really want to try this out!